Feeling the pinch this Christmas? Or are you just plain skint? Basil Howitt was dismayed by the ever-increasing need for charitable handouts in Perpignan and at Christmas. Nevertheless, the spirit of Christmas survives gloriously in the unstinting help of so many voluntary workers, and in the legendary, late and great Jordi Barre’s Pessebre or live representation of the Nativity Story. Amongst the three towns in the région with a population exceeding 100,000 [the others being Montpellier and Nîmes] Perpignan is the one which, in view of the economic circumstances of its inhabitants, might be considered the most precarious. … The people in economic difficulty often live in the north and centre of the town. A few years ago, INSEE [France’s Office of National Statistics] published the results of an enquiry showing that after Corsica, which has the highest poverty count in France … the Pyrénées-Orientales, the Aude, and Seine-Saint-Denis came second equal. The plethora of Christmas markets in the Perpignan area might suggest a thriving economy. There are foires au gras galore – literally “fat fairs” selling confits of duck and goose, charcuterie, and countless other gastronomic goodies both savoury and sweet. At Bourg Madame, Prades, Thuir, Céret and many other places, stall holders have been trying to charm money from punters’ pockets. 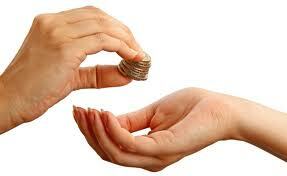 I wonder, however, how much money has actually changed hands this year? My wife Clare sells her cards, paintings and calendars every year at a dynamic village in the Albères, one that is by no means on the bread line and peopled with a fair number of expats from northern Europe. Normally she and her colleagues do quite well, but she reports that this year has been the worst ever for everyone. What a shame! – particularly for those selling food of all kinds. Some get up at the crack of dawn, travel fair distances, set up, wait for punters who just gawp and never buy, pack up and go home again – expenses sometimes not even covered. It seemed like more of the same at a Sunday fair we both visited in Rivesaltes in mid-November. In spite of the town’s largish population (c.8,500) business was “calme” – the French stoic euphemism for nothing much doing at all. None of this is surprising. If expats everywhere are feeling the pinch because of the strong euro and disastrous interest rates, far too many local residents in the P.-O. and the Aude – about 18% of them – are living on the bread line, or the “threshold of poverty” as officially identified. As I understand it from the bewildering maze of statistics, this is currently defined in France as a disposable income for an individual of below 757 euros per month. No wonder the P.-O. needs its soup kitchens! 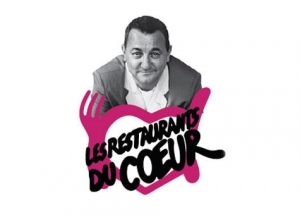 Les Restaurants du Coeur (The Restaurants of the Heart), normally abbreviated to Les Restos du Coeur, is the French charity founded by the irreverent and hugely popular comedian Coluche (Michel Colucci) in 1985. His professional garb was a yellow T-shirt and blue-striped salopettes. He was one of those genius nutcases who was plagued by alcoholism, sacked by two radio stations for vulgarity, and who died tragically young at the age of 41. His motorcycle crashed into a truck on a road in south-eastern France: perhaps not altogether surprisingly, since he reportedly held the world speed record for a 750cc motorbike! Some conspiracy theorists, however, claim he was murdered. The Restos’ main purpose is to distribute food packages and hot meals to the needy. Having learned that surplus products cost more to store than to distribute for free to the poor and hungry, Coluche made a plea for the Restos’ cause to the European Parliament in February 1986. His plea was successful and the surplus was later made available, though this has been supplemented by France’s two biggest supermarket chains, as well as by private organisations and individuals. The campaign is now in its 25th season, and has spread beyond France to Belgium, with centres in Wallonia, Flanders and Brussels. What a success story! Altogether, according to the Resto website (see below) 55,000 volunteers have distributed some 100,000,000 meals to 800,000 needy people in 2,028 centres. 1,000,000 meals in 14 centres In the P.-O. this year 417 volunteers under their local president Pierre Olibo launched their annual campaign at the beginning of December in 14 centres. They will have more work than ever before. Whilst demand used to rise at an annual rate of 10%, in 2008/2009 this figure trebled to 30%. Monsieur Olibo anticipates a similar increase this season, with “at least a million” meals being served to 10,000 applicants. Les Restos everywhere are not only concerned with providing food: help with accommodation (under the wing of Les Toits du Coeur or The Roofs of the Heart), training, finding jobs, legal problems, child rearing, clothing, toys and hygiene products are all part of the agenda. M. Olibo notes another new development: 17% of the requests for assistance now come from those in work, either salaried or self-employed, but on low incomes. Allez! Un joyeux Noël et une bonne année à toutes et à tous!